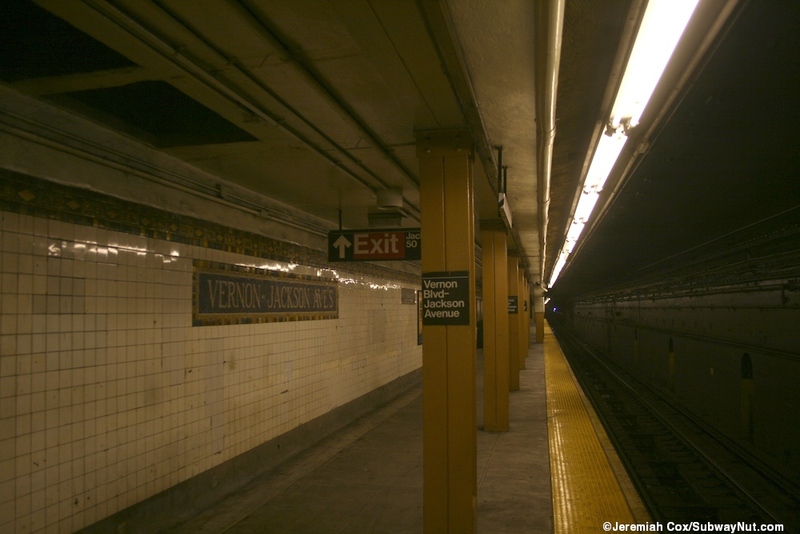 Vernon Blvd-Jackson Avenue has two side platforms for the two track line and is located at the entrance into the Steinway Tunnels that carry 7 trains into Manhattan. These tunnels were originally built to accommodate interurban trolleys in a construction project that began in 1892 stopped in 1893, restarted in 1902 and completed in 1907. The tunnels had some test trolley operations but the company lacked a trolley franchise with the city. Eventually in 1913 the tunnels were sold to the city and modified to handle IRT subway cars with extra motors to allow them to climb and descend the steep grades in the tunnel. 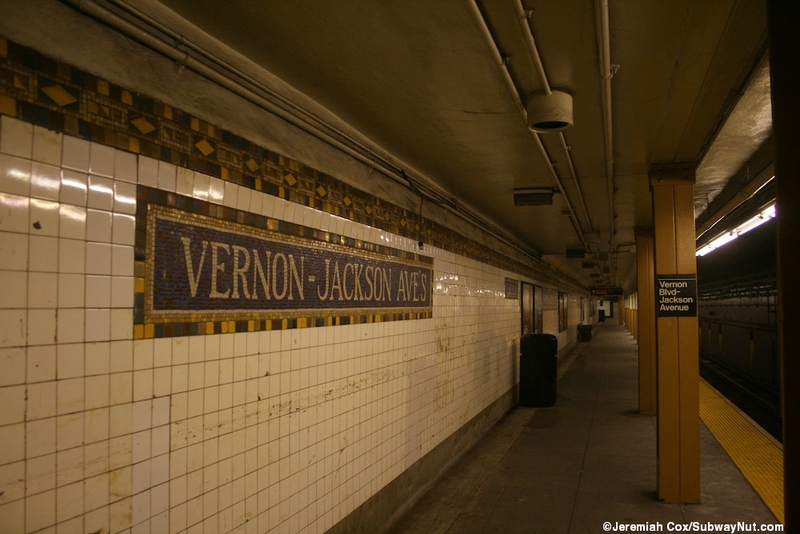 Vernon-Jackson Avenue (the station's original name) began as the terminus of predecessor to today's 7 train as a shuttle beneath the East River from here to Grand Central on June 22, 1915. 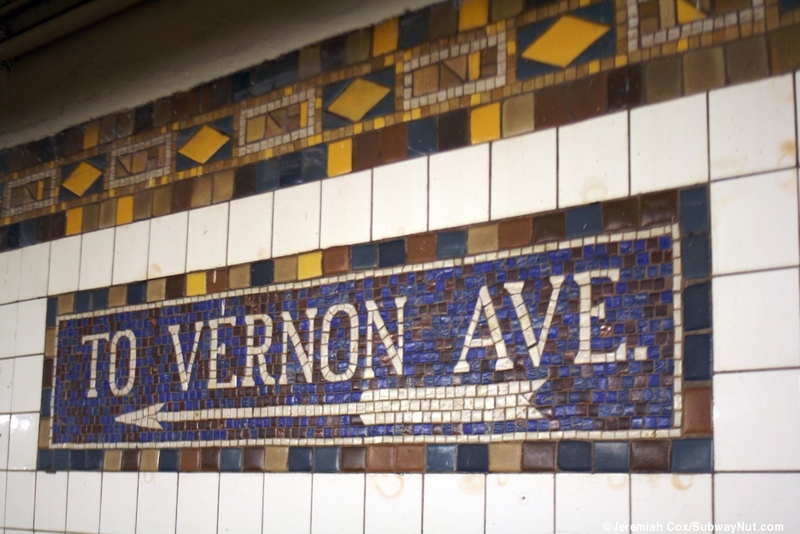 In 1916 the line was no longer a terminus and extended to Queensboro Plaza. 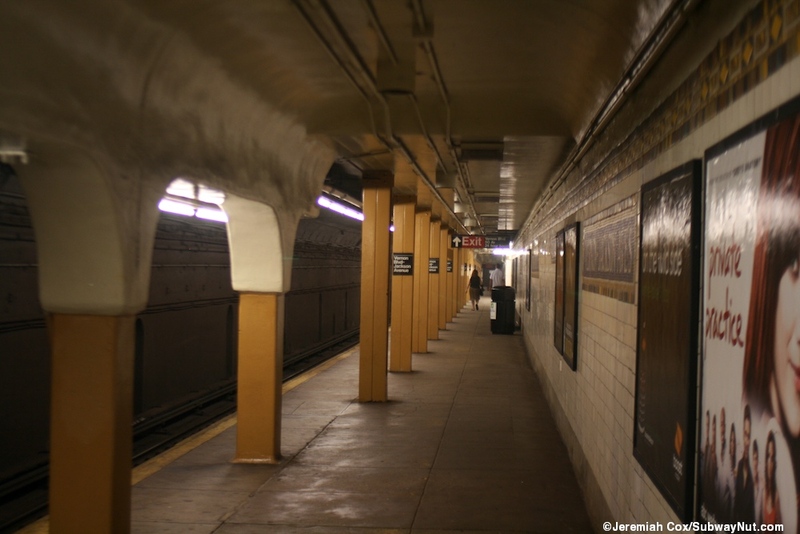 The Steinway Tunnels are maintenance headache for the subway because their original design for trolley cars mean they are narrower than normal subway tunnels and lack any clearance for track workers to do routine maintenance tasks. This means that the entire tunnel tube and 7 service through it (single tracking does occur sometimes) for anything (even the changing of light bulbs) to be done in a tunnel. 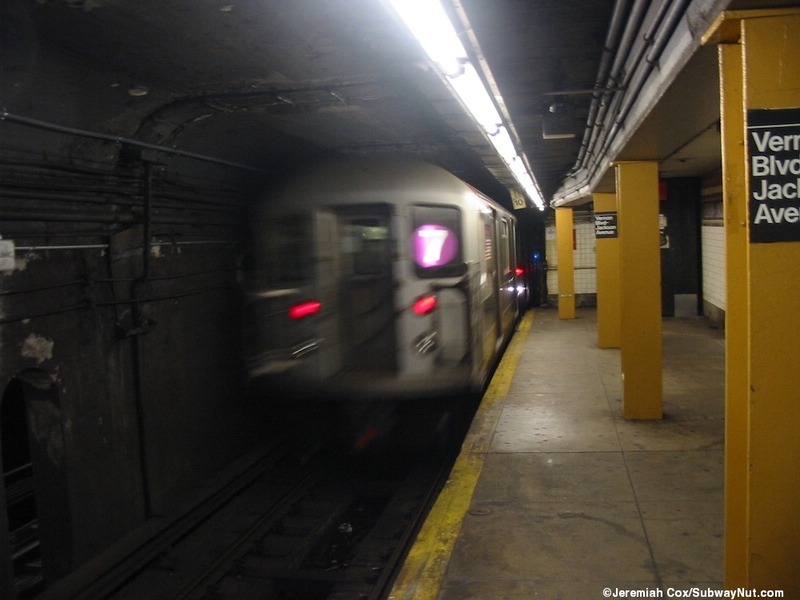 This means these tunnels have an unfair share of weekend shutdowns compared to others in the subway system. 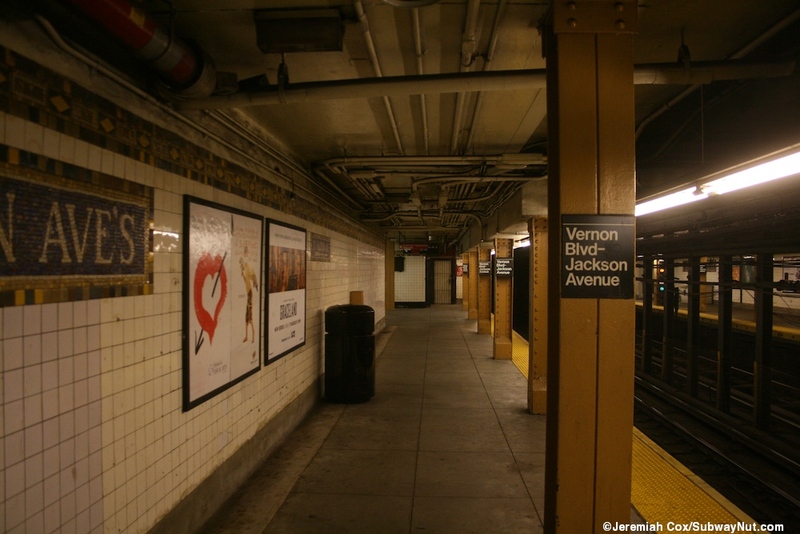 The station was renovated with clean-up and receiving a new platform floor with a tactile warning strip in 2012. 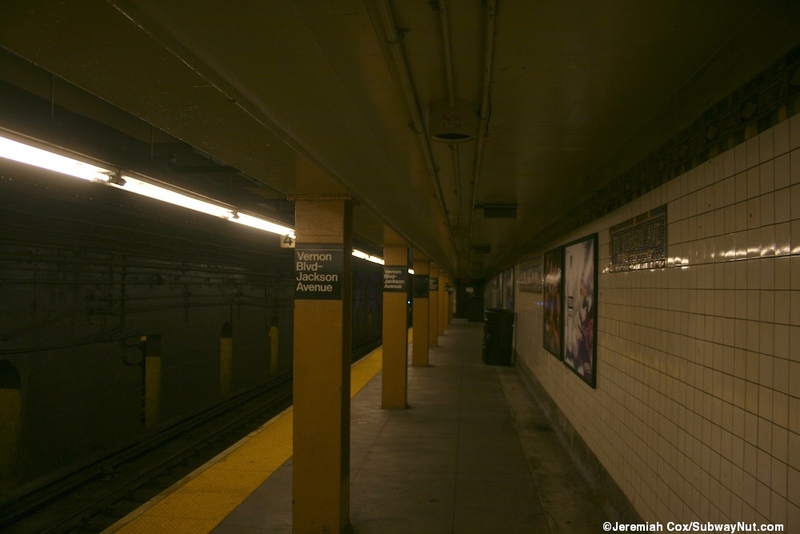 The two side platforms at the station itself have a line of yellow columns along the edge of the tracks, for most of the platform these are normal I-beam columns. 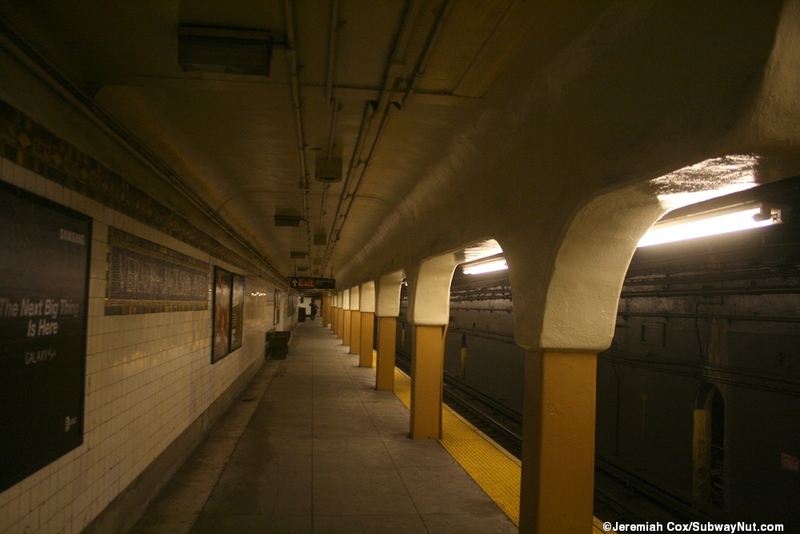 In the middle of each platform for a couple cars is a unique area with short yellow columns holding up cream colored arches (also the color of the station's painted ceiling) starting at about four feet off the ground. 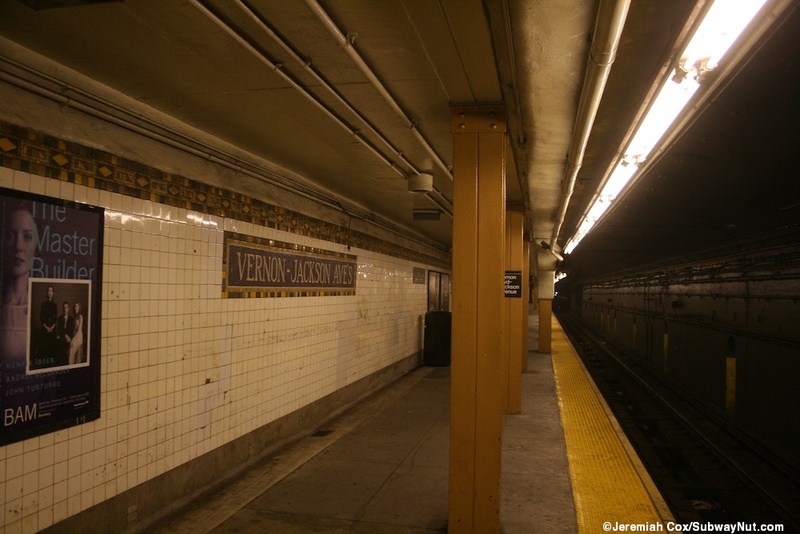 For most of the station there is a full height wall (with little cut outs between the tracks) even though the station is just beneath the street and not all that deep. 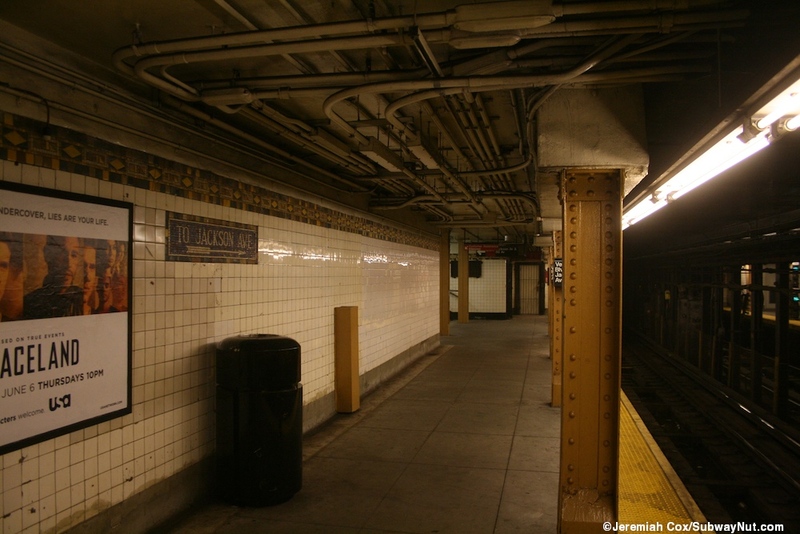 The walls of the platforms have a narrow gold and brown trim line that lacks any lettering in the middle of it. 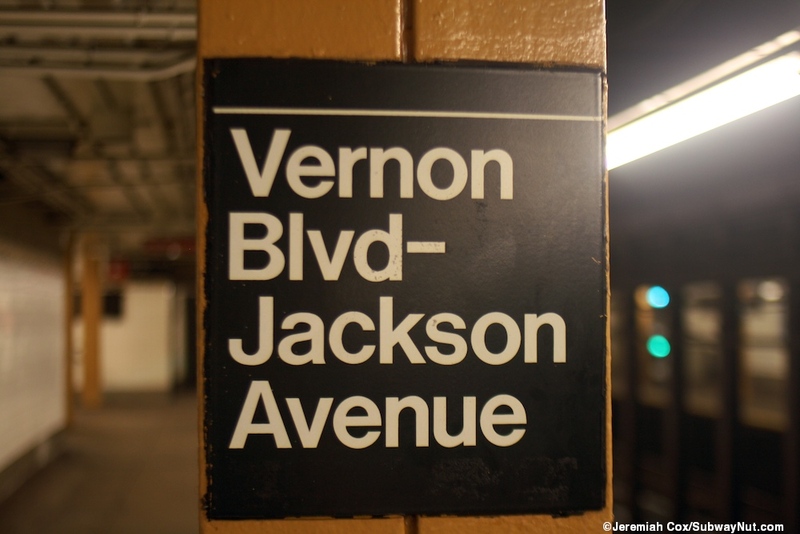 The name tablets are white with white text for Vernon-Jackson Ave's on a brown background with a gold and brown border. 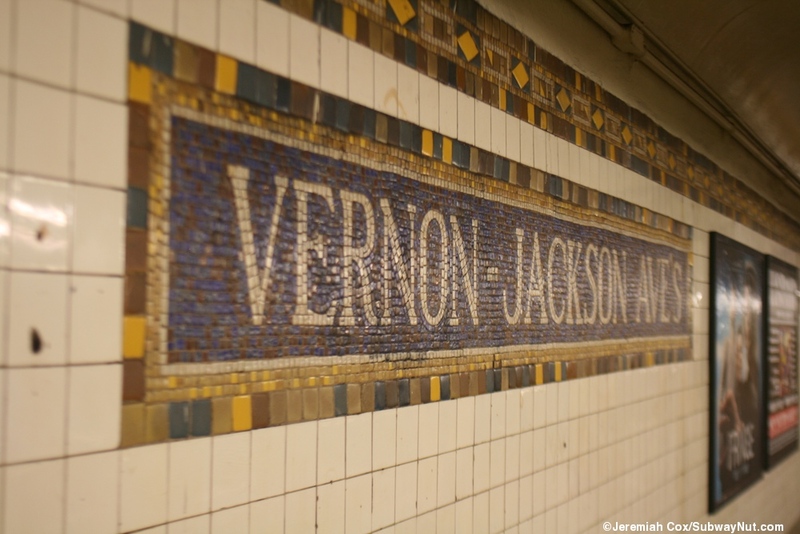 There are also a few directional signs for Vernon Ave or Jackson Ave with an arrow beneath (the station has nearly always had two exits). Each platform has two exits directly on the platforms, there is no free change of directional transfer. Just west of the middle of the station are the regular turnstiles. The Manhattan-bound platform still has a token booth. From the Manhattan-bound platform these lead up to two streetstairs both at the NE corner of Vernon Blvd and 50th Avenue. 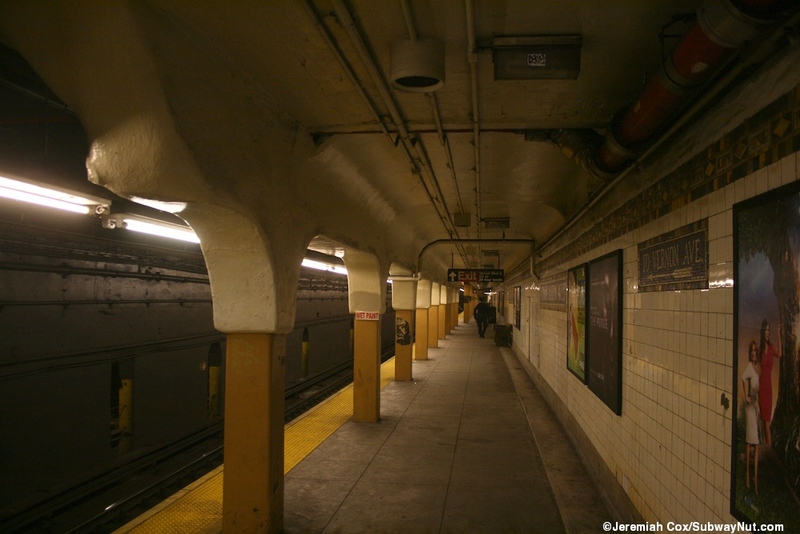 The Flushing-bound platform has two streetstairs both at the SW corner. 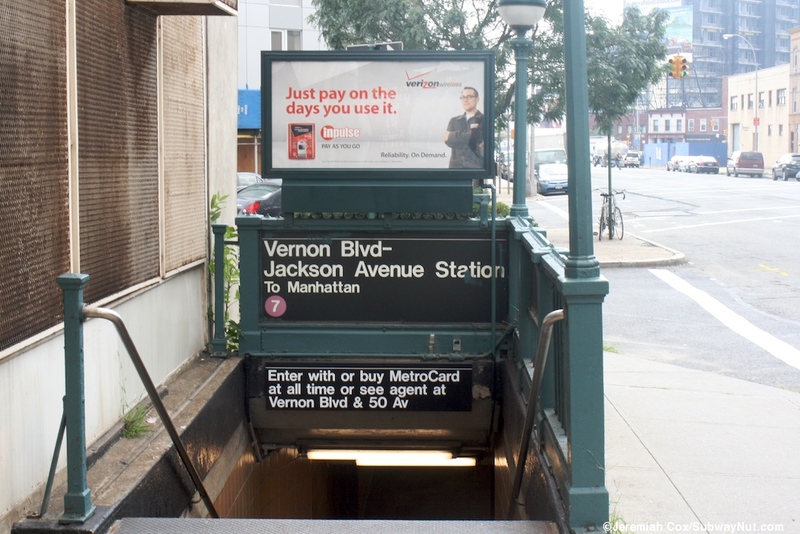 One of these currently has a station name sign missing, there is a staircase but simply a fence beneath the advertisement above where the normal black sign indicating the name of the station and lines served should be. 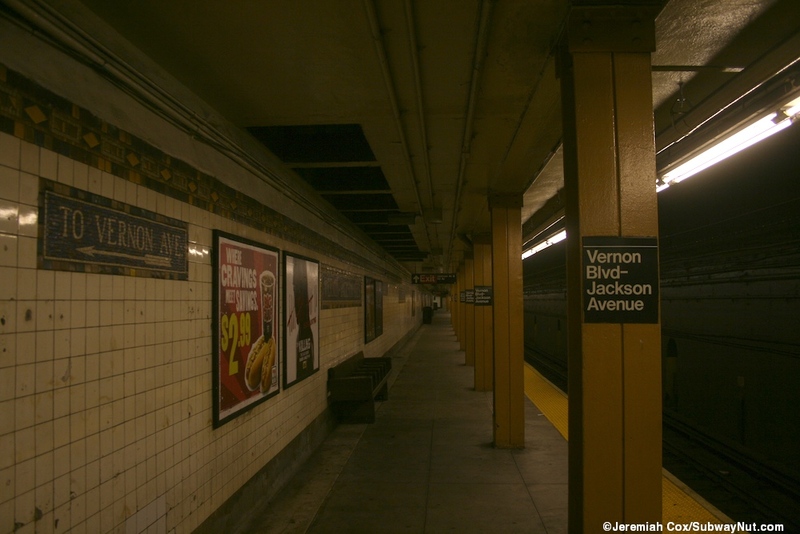 The Jackson Avenue end of the station is where things are a bit more interesting. 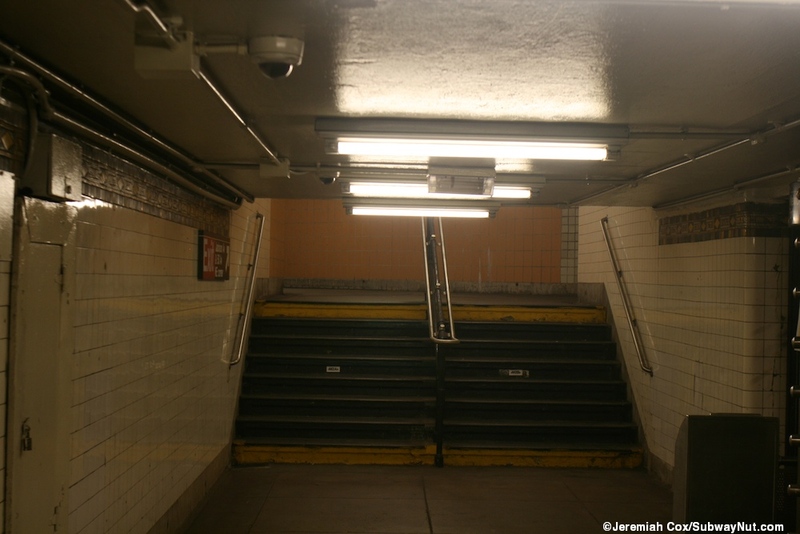 On the Manhattan-bound platform are a few steps up to some high entrance/exit turnstiles. These lead out to two streetstairs one at the NE and one at the NW corners of 50 Avenue and Jackson Avenue. 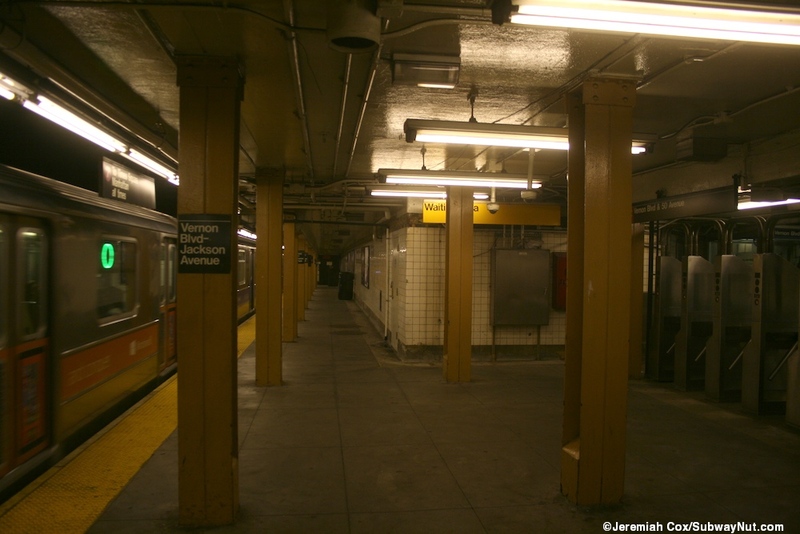 The Flushing-bound platform has a similar arrangement with a few steps up to a wide intermediate landing. 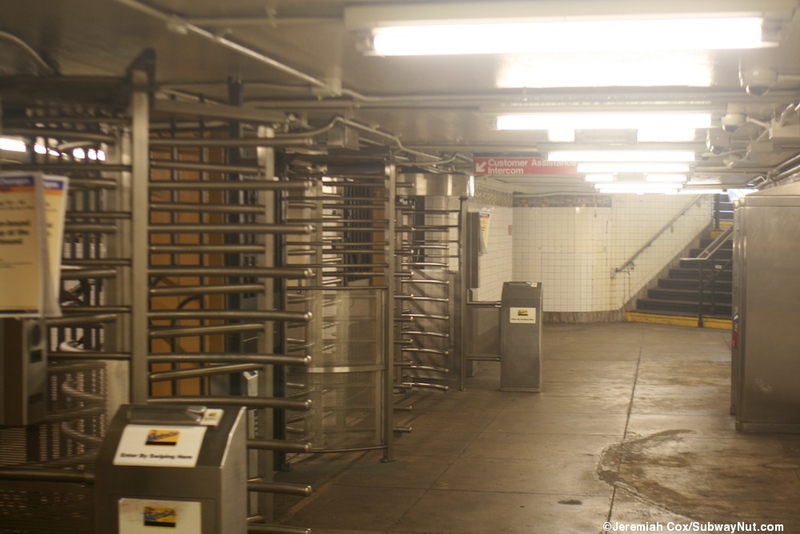 There isn't a wide fare control fence, (but a temperary silver wall) just a single high exit turnstile before a streetstair up to the SE corner and a seperate high exit turnstile before the streetstair up to SW corner. 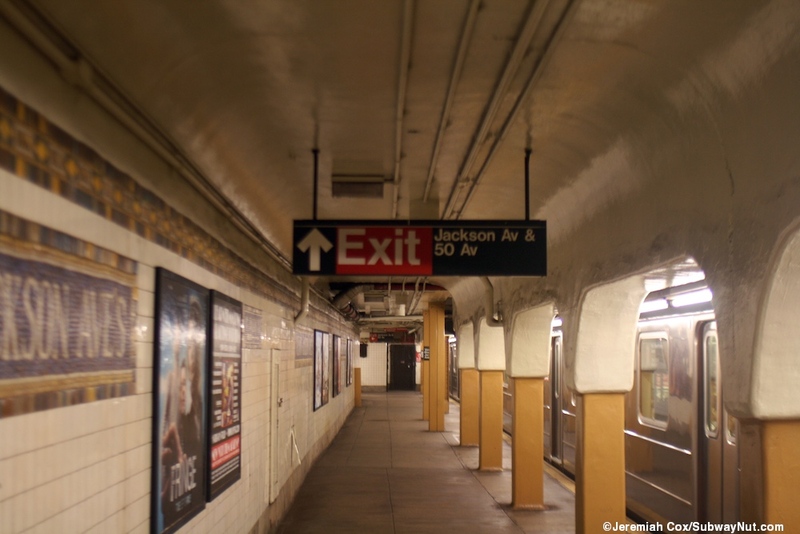 The Jackson Avenue end of the Flushing-bound platform is exit only! This needs to change in the MetroCard unstaffed turnstile age. This is one of the few holdouts from the old era when all fare control areas for entering passengers had to be staffed before the late 1990s. 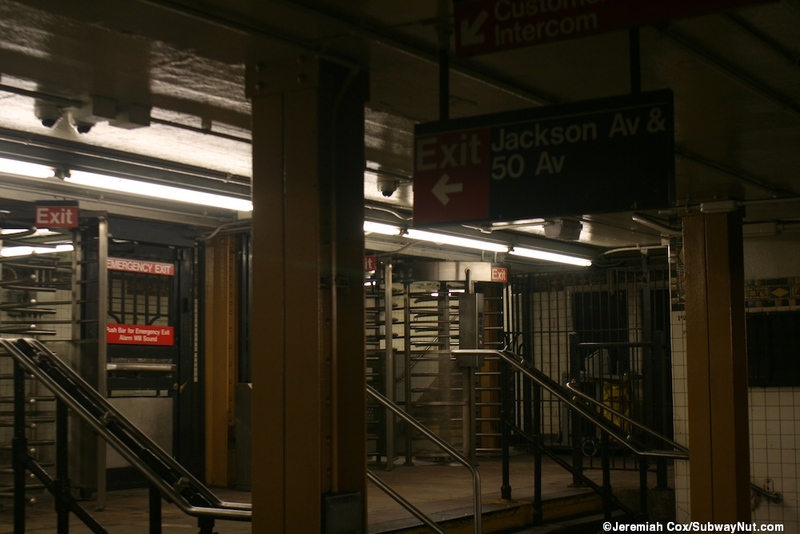 The Manhattan-bound Jackson Avenue entrance at one time had a part time token booth and regular turnstiles.